Dr. Sims was born in Chattanooga, TN, on January 26, 1932, the son of the late Oliver H. Sims and Floy Belle Silver Sims. After a childhood throughout Middle and East Tennessee, he graduated from Isaac Litton High School (1950) in Inglewood, TN. 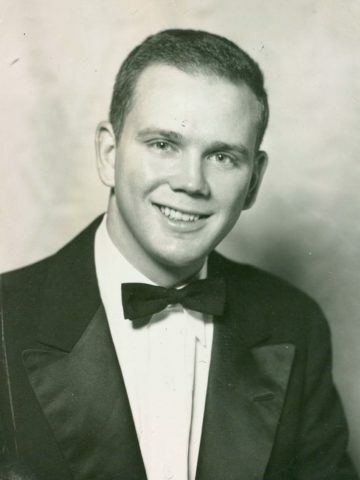 He then attended Vanderbilt University, leaving after only three years to attend the University of Tennessee Medical School and graduating in 1957. After medical school, Dr. Sims was commissioned into the U.S. Navy where he completed his medical internship and later his residency in orthopedic surgery at the A.I. DuPont Hospital for Children in Wilmington, DE. He subsequently served fourteen years in the Navy with stations at Charleston, SC, Philadelphia, PA, and Bremerton, WA, earning the rank of Captain and receiving the Legion of Merit. After separating from the Navy, Dr. Sims entered private practice in orthopedic surgery in Cody, WY for one year and then returned to Tennessee to practice orthopedics in Madison, TN for over 20 years. During his practice in Madison, he was on staff at several hospitals, including Nashville Memorial Hospital, where he served as Chief of Staff, Tennessee Christian Hospital, Hendersonville Hospital, and the Sumner Co. Regional Medical Center. Seeking new experiences, Dr. Sims left his private practice to serve as Chief Medical Officer for Aramco Oil Company in Dhahran, Saudi Arabia for a year and a half. Still seeking new experiences, and feeling nostalgic for his military days, he accepted a commission as Colonel into the U.S. Air Force where he served as Medical Group Commander at Bitburg, Germany, the Air Force Academy in Colorado Springs, CO, and Jacksonville, AR. Upon retiring from the military after 22 years of service, Dr. Sims once again returned to Tennessee and practiced clinical orthopedics at the Nashville Rehabilitation Hospital and the Nashville VA Hospital, where he retired from medicine at the age of 81. Throughout his distinguished career, Dr. Sims dedicated time to train and educate other physicians and to volunteer in numerous professional organizations. He was on the clinical faculty at Vanderbilt University School of Medicine and was a Fellow of the American College of Surgeons and the American Academy of Orthopedic Surgeons. He also volunteered for Doctors without Borders in Japan and Fiji and was a generous benefactor of the Sumner County Humane Society. In his spare time, Dr. Sims enjoyed reading poetry, collecting art, traveling the world and drinking French wine. He was a legendary maker of a good patty melt sandwich and loved listening to Glenn Campbell and spending time with his family and pets. Above all, and more than any aspect of his career and life, Dr. Sims will be remembered for his gracious, gentle and loving disposition and for his unfailing devotion to his family, patients, and friends. In addition to his parents, Dr. Sims was preceded in death by his wife, Margaret Ann Sims and his brothers, Richard and Charles Sims. Survivors include his children, Deborah (Walter) Choate of Nashville, Candace (David) Newsom of Hendersonville, Leigh Sims of Hendersonville, and Norman Sims, Jr. of Houston, TX; grandchildren, W. Stephen (Kathryn) Choate, M.D. of New Orleans, LA, Caroline (Edward) Hillard of Nashville, John-Michael Burrow of Nashville, Travis Uga of Chattanooga, and Margaret (Chance) Uga-Boles of Portland, TN; great-grandchildren, Grace and Anna Choate, Bo and Hampton Hillard, Laska Uga-Boles, and Kellen Boles; brothers, William, Donald, and Roger Sims; and a sister, Helen Sims Smaw. Funeral Mass will be held March 16th, 2:00 PM at Cathedral of the Incarnation Catholic Church. Inurnment will follow at Calvary Cemetery with full military honors. Gathering of family and friends will be held March 16th, 1:00 PM at Cathedral of the Incarnation Catholic Church. Flowers will be accepted or memorial contributions may be made to Doctors Without Borders, 40 Rector Street, New York, NY 10006. The family would like to give a special thanks to Dr. Sims’ caregivers Monique Waters, Jessica Wiley, and Tonia Taylor. I just read an article about this, Great read. The world of Polygamy and Polyamory is very interesting.